Phew! 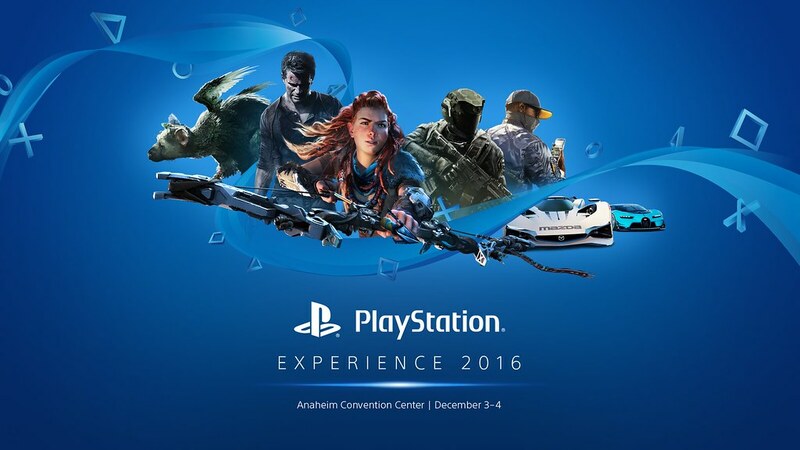 Team PlayStation is hard at work putting the finishing touches on PlayStation Experience 2016. I have a feeling that it’s going to be truly special. With thousands of you flying in from all over the country — even the world! — it’s time to provide a few more details on what awaits this December 3 and 4 at the Anaheim Convention Center in Anaheim, CA. Don’t worry if you don’t have your tickets yet, we still have some available right here. But hurry, there’s no telling how long they’ll last! The action will kick off on Saturday at 10:00am sharp with our big PlayStation Showcase, but take note: as always, seating space will be limited! If you want to sit in on PlayStation Showcase, plan to arrive bright and early — doors will open at 8:00am, but the line will likely be well underway by that point. Then come the panels. We’re locked and loaded for six developer panels this year, and in my humble opinion it’s our strongest lineup by a country mile. I hate to go all cloak-and-dagger, but we can only reveal three of the panels at this time. Trust me: the other three will be worth the wait! And of course, we’re honored to be hosting two great gaming competitions on site. Capcom Cup 2016 will return to PlayStation Experience on December 3, where the Top 8 finalists will compete for their share in more than $350,000 and to be crowned the Street Fighter V World Champion. And Call of Duty World League will will take place at PlayStation Experience on December 3 and 4. As part of the eight-team invitational, Splyce, Team Elevate, Rise Nation, Faze Clan, Luminosity Gaming, Orbit, Renegades, and Evil Geniuses are scheduled to compete during the first official LAN broadcast of Call of Duty: Infinite Warfare. If you haven’t gotten your ticket yet, they’re still available at at the official PlayStation Experience site, but don’t wait. See you in Anaheim! Thats not to say that I am not excited to play Horizon, Persona 5, Yooka-Layle, Gravity Rush 2 and Farpoint (among many others). FFXV Release date is set to be prior to the event… So there is no need to “announce” them there. My concern (or hope) was that Final Fantasy XII, Nier Automata, Dragon Quest XI, Dragon Quest Heroes 2, Kingdom Hearts 2.8 and the Kingdom Hearts Collection are all coming or hopefully coming sometime soon. I thought that this event would have been a great place to showcase them. It’s probably because Square enix isn’t attending. @godzilla4352 Oh you bet I will check it out. Its on my list for sure. I will check out Yakuza 0. Especially since I have never played one before. PlayStation Experience this year (though for the discerning eye, you’ll only see 96 on this list). Again, these are only the games we’re allowed to talk about for now. Plenty more to be revealed in Anaheim! There are still 3 panels not revealed yet, I’m assuming square enix and FFVII remastered will be one of them. I’m hoping to see more on ARK: Survival Evolved. Me too. Maybe next year. I hope the rest of the games that are not shown on this list are interesting games. Y U NO FEATURE MOAH YAKUZA 0?! One of these years I will make it there in person. How much longer till NA gets the Gravity Rush 2 demo? That demo would be a great reason to use PS+ like japan did. No OpTiC this year? What happened? Sad by the absence of What remains of Edith Finch. I hope all is doing well with this title. I loved Unfinished swan. To anyone who is familiar with the Anaheim convention center, is there parking on site? I haven’t found a concrete answer anywhere else. Beanly: I’ve been to the Anaheim Convention Center many times. There is a large parking structure right next to it. Have a great time, everyone who is going. I hope some of it is streamed so I can watch. Oh, and leave some time to go to Disneyland, which is across the street! So when can we pickup the badges? I can’t wait this will be my time going to the PlayStation Experience. When will we get our tickets/badges? I’m so looking forward to what Sega is gonna show off with Yakuza 0. That list is not complete until i read SOCOM REMASTERED, The Puppeteer 4K Pro Enhanced and Bloodborne Game of the Year Pro Enhanced Editions! The list is not too bad, even though I was hoping that Insomniac’s Spider-Man game will be on the list because other than the E3 trailer and clips of it at the PS4 Pro announcement and the King trailer, he haven’t got any info on that game. I know I can already trust Insomniac making a Spider-Man game (especially after playing the first three Ratchet and Clank games and the two Ratchet and Clank Future games (Tools of Destruction and A Crack in Time) as well as memories of playing the first two Spyro games on the PS1), I really want to know more about it because so far the last great Spider-Man game we have is Shattered Dimensions, so I’m hopeful that Insomniac will deliver something awesome for us Spider-Man fans. One of those panels must be Kojima… I wish I could go. Would like some variety on the invited podcast. Kinda funny has been bad lately. PUSH YAKUZA 0 LIKE ITS A GODDAMN ROCK IN FRONT OF THE DOOR TO YOUR HOUSE! Anybody remember a game called Road Avenger/Road Blaster FX jp for the Sega CD , I’d love to see a remastered of that game . I highly recommend everyone that they try Yakuza 0, it’s super amazing! After putting 50+ hours into the Japanese version of YAKUZA 0, I cannot WAIT to get my hands on the Western version in January. Anyone with a passing interest in Japanese culture, brawlers, adventure games, RPG’s, and enjoys a thoroughly enjoyable character drama, PLEASE give this game a shot! If you’ve not played a game in this series before, YAKUZA 0 provides an ideal jumping on point. OUT JANUARY 24TH! It’s one ticket per person. I think your friend would have to register individually. What if they don’t have a playstation account? Then what? You don’t need to use your PSN account. Anyone can buy a ticket. Using your PSN just lets you secure specific goodies, such as download codes or avatars. Ok so I buy my ticket with my psn and then buy them a ticket not using my psn? ACE COMBAT 7!! I see you on that list! So excited to hear more about it next week! Same so stoked for this! Ace Combat 7!!! Yes yes yesssss psvr killer app!!! I have dreamt of flying a fighter jet since I was a kid and the ace combat games have always been the best in my opinion. Please give us the ps2 era ace games digitally or bring infinity to PS4 to start the hype train for 7. Also a badass fighter jet dynamic theme would be appreciated! Yakuza 0 is gonna be the must have game for PS4 I can’t wait! ACE COMBAT 7 YEEEEEEEEESSSSSSSSSSSSSSSS OMG IM SO FCKN HYPED!!!! Why is there no break between panels again? Last year every panel had 20 minutes of complaining about the lack of a buffer between panels and how they didn’t have enough time to do everything they wanted. How many of these games will be released within a year of PSX? Persona 5 is on that list, I wonder if the game will get pushed yet again when we’ll get closer to its release date for a alternative in game text DLC. Hey Everyone, please follow us over at @GameOctane on twitter and our website http://www.GameOctane.com. We are still fairly new but are trying our best to get the coverage you the fans want. We will be at PSX this year. Let me know what you guys want to see or know more about and we will add it to the list of things to cover in more detail. I am excited about Horizon Dawn for sure. EarthNight is another great one to check out, I saw them last year at PSX and its a pretty fun game! Its too bad that Gran Turismo Sport got delayed, but hopefully its with good intention. Don’t forget to hit us up on Twitter and let us know what you guys want to see covered at PSX this year! Thanks! Where there be an afterparty? I stayed until the last minute last year and was kind of bummed there was nothing after.